Personally, I’ve often struggled to discern between my instincts and my intuition until a year ago (see my story of Self-Love). In the dark days of winter, my asana practice would suffer, my eating and sleeping habits wobble, and I begin questioning myself: Is sleeping in to skip my pre-dawn sadhana (aka yoga practice, chanting or anything you do to align yourself with the day) an intuitive moment of self-care, or an instinctive aversion to the traditions that would unhook me from the bonds to find I can awaken? “Only you know for sure,” my mentors would say. Frustratingly accurate since, ultimately, we are each our own best teacher. How did this help me when my alarm shrieked into the cold darkness of 5:30 am? Unlike instinct, intuition has no future and no past. It lives entirely in this very instant. It’s plugged into the vast network of the universe and is known by the name of vijnanmayaskosha (also translated as innate wisdom). 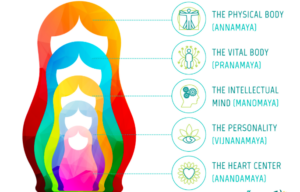 This is a term from Ayurveda, where our being is explained through the layers of five sheets. And because we are talking about wisdom here, I would call it a genuinely trustworthy brick for laying the path for self-healing that leads to dharma. Listening to the voice of our intuition is coming home to a place we never left. That sounds pretty awesome, doesn’t it? It’s what we know as Socrates famous; Know thyself! The trouble is, a lack of discernment between instinct and intuition inevitably creates confusion in interpreting the messages that each carries. It is easy to get into the habit of compulsively searching, seeking and rushing from one thing to the next, to keep ourselves distracted from uncomfortable feelings. Self-awareness is indeed the bedrock upon which discernment is built. How do we create self-awareness that is true and not filtered through constant desires? The answer to it lies in the other layers. When our body works like it should (in rhythm with the circadian cycles), showing us that we can have radiant health, when we can breathe in line with our emotions, because we are not suppressing them and giving prana the space it needs to circulate, When our mind and intellect is clear and less fogged or struggling to bring 1 and 1 together, then our intuition can work and it shows through self-esteem. This is why the Ayurveda comes up with the term dinarcharya – daily routines and workouts. And why Yoga is talking about Yamas and Niyamas – behaviours for mental health and observances for living in harmony with the world around us. This is an awful lot to digest, I know. But the light at the end of the tunnel is that you can find a way in. Only, if you believe in the magic of process, not instant remedies. Because with trust into time and process, you will be able to notice that any atomic adjustment will get you on track with your healing powers that are lying in your inner wisdom. 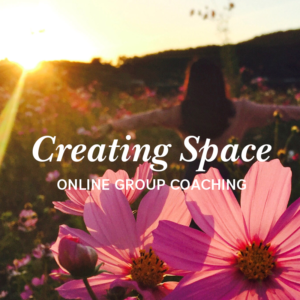 Join me on my Yogic RoadMap (Creating Space). Give yourself a year and you will be a person on track with your mental well being. With Self Awareness Skills that are doable. A person that makes choices because they are in line with your dharma. And where you can experience life as flowing.